On Friday, I decided to see the new film Amelia starring Hilary Swank and Richard Gere at the AMC movie theater on 42nd Street (tickets cost $6 before 12 noon). I'm writing a chapter on Amelia for Scandalous Women, and I thought this would be a great way to get in the mood. Movies should never be used for research, but I was eager to see what the filmmakers did with Amelia Earharts story. The film starts off with Amelia Earhart along with her navigator, Fred Noonan on the last leg of her around the world flight. 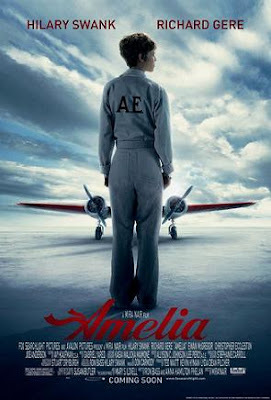 The movie is told in flashbacks from her childhood when a young Amelia is first captivated by the sight of an airplane. As a young woman, she is recruited by publishing tycoon George Putnam to become the first woman to cross the Atlantic, the catch is that she can only be a passenger, she can't fly the plane. She's actually replacing Amy Phipps Guest, a rich socialite who was supposed to make the trip. Amelia agrees because of the publicity it will be bring to aviation and in particular to women pilots. While stuck in Newfoundland, Amelia chastizes one of the pilots for drinking, telling him that she will take over the flight if he doesn't get his act together and get on the plane. When they finally land in Wales, Amelia is thrust into the limelight as the most famous woman pilot of her time. Putnam helps Earhart write a book chronicling the flight, the two gradually falling in love , and they eventually marry although she forces him to promise to let her go within a year if she's unhappy. Amelia is embarrassed by all the hoopla and publicity work that she has to do, since it has nothing to do with flying, so she decides to become the first female pilot to fly solo across the Atlantic. The film flashes forward through the next decade as Earhart falls into an awkward and unconvincing love affair with Gene Vidal, an aviation pioneer probably more famous for being the father of author Gore Vidal. She reconciles with Putnam but is determined to do one last flight, an around the world flight that no one has successfully completed. Earhart's first attempt ends in a crash landing in Hawaii. Due to the time it took to make repairs, Amelia is now forced her to take the plane in a reverse direction, leaving the lengthy transpacific crossing at the end of her flight. On the way to refuel on tiny Howland Island, radio transmissions between a Coast Guard picket ship and Earhart's aircraft reveal a rising crisis, as her fuel begins to run out. Her last message is a cryptic position report. The film's ending is ambiguous since what really happened to Earhart that fateful day is not known for sure. Directed by Mira Nair, the script was written by Ron Bass and Ann Whelan Thompson. The screenplay was based on two biographies of Earhart East to the Dawn by Susan Butler and The Sound of Wings by Mary S. Lovell. Amelia is a disappointing, curiously uninvolving and bloodless biopic of Amelia Earhart, which is a shame because it had huge potential to be an amazing film. Hilary Swank was born to play Amelia Earhart, it is a role that fits her like a glove. She even looks like Earhart. Unfortunately she's stuck with a script that falls apart whenever it comes down from the clouds. Bass made the decision to include a great deal of Amelia's own words in the script. The problem is that it sounds like Swank is reading aloud from Earharts biography than actual dialogue. It comes across stilted and phony, as she were giving a commencement address or a public service announcement. The least interesting aspects of the film are the ones that deal with her personal life. The audience never really gets to see her relationship with Putnam development. They also cut out Putnam's first wife Dorothy (who was played by Virginia Madsen), who he was married to when he first met Earhart. In fact, Earhart dedicated her first book to Dorothy. In real life, not 'reel' life, Putnam accompanied Earhart when she met her first transcontinental flight from New York to Los Angeles, becoming the first woman to do so. If the filmmakers had included a few short scenes during this flight, we might have the chance to see the 'love' relationship between the two grow, as opposed to their 'professional' relationship which is covered nicely. Another curious scene details Putnam telling Earhart about how she's going to be endorsing Lucky Strikes cigarettes despite the fact she doesn't smoke. Nowhere in the film does the audience learn how shocking it was for a woman in the 1920's to endorse cigarettes when women smoking in public was still frowned on, or the fact that Earhart lost a job as McCall's aviation editor because of it. Her subsequent extramarital affair with Gene Vidal is curiously bloodless, they seem to sleep together just because they both like planes. In another curious scene, Amelia compliments another woman, while they are sitting in a hotel lobby, making particular note of her gorgeous legs. For a brief second, I thought the film was going in another direction, was Amelia about to suggest a three-some? Come out? No, instead it turned out that she just hated her own legs, which Vidal points out not Amelia. It was a WTF moment in a film that needed more juice. Her scenes with Gene's son Gore seem to be tacked on as if to say 'and look she's also good with children!'. I would love to know how Vidal feels about being portrayed as an adorable, mop-haired tyke straight out of central casting. When the film deals with Amelia flying, it's on a surer footing. The scenes of her preparing for her first flight across the Atlantic and at the end when she's on her way around the world are mesmerizing. Warning: if you don't like to fly, you will not like this film. There are quite a few scenes filled with turbulence and danger. There is one big continuity gap that stands out. The title card before the scene says that it is 1932, but all the signs at the big aviation race for women all state that it is 1929 which is when the race took place. Also, Amelia comes in third, and it is never explained that she stopped to help a fellow pilot out who had serious problems. Another huge problem for me with this film is that Amelia never seems to ever get upset, or angry. Swank plays her primarily as awkward but with gumption. In 'real' life Earhart might have been that even-keeled, but it makes for a boring movie. You long for her to throw a tantrum or something. When Amelia and the two pilots are stuck in Newfoundland at the beginning of the film, Amelia lectures one of the pilots in a rather unemotional way about her father being a drunk. I'm not a child of an alcoholic but that has to leave some kind of emotional scars and it would have been nice to see more of that. Even when she ends her relationship with Vidal, it's kind of bloodless. So I would have to recommend that if you want to see this film, that wait until it comes out on DVD in the Spring. Perhaps if Clint Eastwood directed it, Amelia would have been a winner? I was fascinated by AE as a child, having read the orange Childhood of Famous Americans Biography in my elementary school library. When I was in 6th grade, I met her sister Muriel and was too in awe to express how thrilled I was, which I regret now. Torn about whether I want to see this or not.